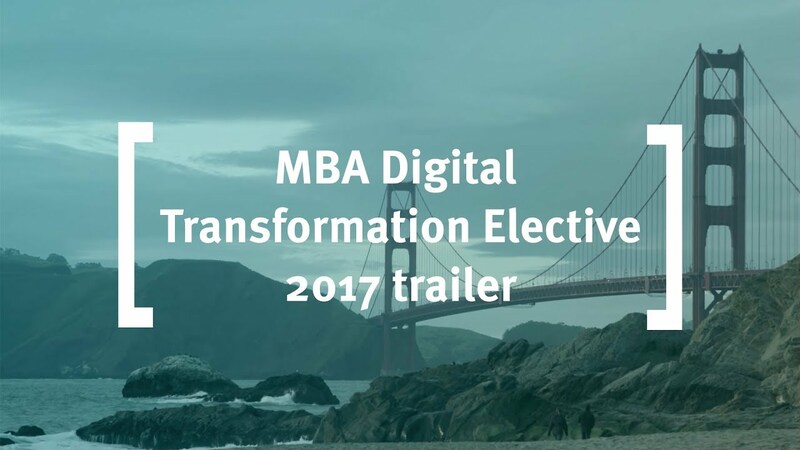 The Digital Transformation Elective, in San Francisco and Silicon Valley Elective gives Cass students the opportunity to immerse themselves in the world's foremost hub for tech and digital innovation. The Full-time MBA at Cass has a flexible approach to learning to help you achieve your career goals. You can choose to study a wide range of electives or focus on a concentration in one specific area. The course aims to equip you with the skills set you need in order to recognize financial and strategy related situations you will come across in your professional lives as advisors or managers. You will focus on some strategic decisions made by healthy and distressed companies, particularly: raising capital from angels, venture capitalists, initial public offerings and seasoned equity offerings, corporate restructuring and bankruptcy. You will be encouraged to view these as ''real life'' situations. The course includes a presentation and discussion of the concepts but also a set of case studies. In order to extract the greatest value, you will be required to prepare and discuss the cases in class. This module aims to help you develop hands-on expertise in applied financial analysis; developing both general skills as well as those specific to certain sectors in finance. It also helps to integrate and extend learnings gathered in previous modules (such as financial reporting, financial statement analysis and corporate valuation) without posing any strict pre-requisites to take this elective. Recognise and understand the major issues in behavioural finance. These include biases, which frequently occur in financial decision-making such as optimism, mental framing, over-reaction, trend-chasing, conservatism and anchoring of expectations. Appreciate modern theory of finance on asset valuation. In doing so, this module complements the repertoire of innovation courses taught in the program – which focus on the innovation development process - by focusing instead on the complementary steps that allow companies to integrate technological innovation in a more comprehensive strategic plan. How to compete in rapidly changing markets that are influenced by disruptive digital technologies? In a world where digital technologies such as Internet of Things (IoT), Big-Data analytics, Artificial Intelligence, Machine Learning, Robotics Automation, Block chain – appear to be changing the competitive dynamics of industries; managers and future business leaders need to understand how to skilfully surf these waves of digital technologies – first separating weak signals from noise and then turning them as a source of momentum to gain competitive advantage! This module focuses on four levels of analysis, each dealing with topics of competition and digital technologies. It starts with topics related to the paths individual decision-makers take to scan, try, and adopt digital technologies followed by an analysis of organizational designs to build digitally savvy enterprises. Then we discuss how organizations use technology as a competitive edge by experimenting and scaling –using lean methodology, and conclude with deep-dives in contemporary topics in digital technologies such as decision making using big-data analytics, artificial intelligence, and automation. To enable participants to develop skills in ‘thinking digitally’ and defining business problems for digital solutions. To build knowledge of the latest concepts in organizational design, managerial decision making, development of ecosystems, and establishment of digital markets. To enable participants to develop a working understanding of the latest disruptive digital technologies, a framework to experiment with these technologies, and current debates in the policy environment. The module is not a course in how to price derivatives, but basic quantitative and arithmetical skills are expected. The course is predicated on the view that the modern business manager should understand the nature and use of derivatives but is unlikely to implement such strategies without expert advice from banks or specialist firms. It is that dialogue course is intended to facilitate, along with an understanding of where derivatives use may be dangerous and even potentially destructive to the corporation. Avoid pitfalls in the use of derivative. The aim of this course is to give you a working understanding of the main quantitative and judgemental methods used to guide business and marketing decisions in general and financial decisions in particular. In addition to conventional business forecasting techniques, the course introduces in an accessible way some of the more exotic techniques in vogue in financial markets (volatility forecasting, technical analysis), and the new techniques of data mining that are increasingly applied in “big data” environments (neural networks, genetic algorithms). Make an informed an critical judgment about commentary and forecasts written by professional forecasters and management consultants. Real estate (land and structures upon it) is the biggest global store of wealth, worth more than equity and bond markets combined. It is typically the largest asset owned by a household, and on the balance sheet of a company, and the most common form of collateral for loans. It is therefore very difficult to pursue a career in business or finance without having to deal with real estate, whether that is through the true value of real estate on the balance sheet value of a target company in a merger, the credit risk of a bank with a large exposure to property loans, or the impact of property cycles on an emerging economy. This module will equip you with knowledge of the most important aspects of real estate as an investment asset. For those who intend to work in general business and finance, it provides the basis to understand the real estate issues they are likely to encounter. For those who intend to specialise in real estate as investors, fund managers or lenders, the module will serve as the foundation for further development. Cash flows, asset pricing and appraisal As for all investments, the fundamental value of real estate estates depends on the cash flows they generate, and the pricing of the risks, liquidity and costs associated with ownership of assets. Topics covered include:- Rents, Market rental values- Rental value growth, depreciation and property yields- Leases and international differences in lease terms- Risk and Liquidity- Costs and required rates of return.- Appraisal methodologies: discounted cash flow and income capitalisation.- Model appraisals for investments and development projects.- Fair value analysis and investment decisions. Investment performance and role in the multi-asset portfolio Real estate is typically the third leg in multi-asset investment portfolios, and a favoured investment for high-net worth individuals and sovereign wealth funds. This session will set out the theoretical basis for the comparison of investment returns on real estate with other asset classes, document the delivered returns from real estate over time and across countries, and demonstrate the effects of including real estate in portfolios constructed on optimised risk-return or asset-liability matching criteria. Real estate portfolios and investment vehicles. The standard portfolio models indicate investors should allocate at least 10% of portfolios, and often much more, to real estate, primarily for its diversification benefits. Accessing real estate performance is however difficult due to its large lot sizes, heterogeneity, high holding and transactions costs, and low liquidity. This session deals with the variety of forms in which investors can obtain exposure to real estate performance, and their implications for the returns and risks the asset will deliver. This module aims to bring investment management and strategic level asset allocation into real life, encouraging you to rehearse skills that will be important in your future careers. Innovation Practice has been created in response to student feedback requesting additional innovation study to what currently exists in the international elective “Innovation and Technology Study Tour: Israel and Palestine”. This module follows on from the aforementioned for those students that select it, and includes working with a company in the zone. Authentically inspire and influence others and be a positive role model. This 5 credit elective will allow you develop and improve your leadership decision-making in challenging situations by increasing your self-awareness and self-reflective capabilities, enhancing your leadership and team effectiveness. Through undertaking one day of classroom learning, including a team-based Leadership Simulation, followed by a practical “Expedition” - a climb, a trek or a social adventure – you will hone your communication and teamwork skills, undertake a “stretch experience” to extend your comfort zone and grow your understanding of what you can achieve. You will spend one day in class developing your understanding of leading in challenging situations by undertaking the Harvard Business School Everest Simulation which involves a challenging expedition towards the summit of Mount Everest and examines leading effective team decision-making processes. During the “climb” to the summit there will be a variety of challenges that must be solved for the team to succeed. In the second part of the day in class, and after the Everest Simulation Debrief, you will examine relevant leadership literature and undertake reflective exercises to prepare for the practical “Expedition”. The managerial decision making elective is both reflective and challenging. It explores how you make decisions, how others may make them and how you can make better and more effective choices with those around you. To use a wide range of performance media for business problem solving. This module focuses on the topics you need to know to prepare yourself for a world where M&A is an integral part of the strategic and financial business landscape. It takes a global perspective, not focused on any one market or industry. The aim of the module is to familiarise you with the various aspects of M&A so that you will be able to understand the general concept in the life of a corporation, how to apply valuation techniques learned elsewhere, to be familiar with the various techniques used in the different stages of a merger or an acquisition (including post-merger integration) and to understand the alternatives to M&A. This is a multidisciplinary module that combines strategy, finance and individual and group behaviour. The aim of this module is to provide students with knowledge of the need for innovation and all aspects of the new venture creation process including feasibility testing, marketing financial forecasting and securing finance. At the end, the participant will be able to produce a comprehensive business plan covering the first three years of the commercialisation of their business idea. Create a business planning process. Private Equity is already regarded as a mainstream discipline within the investment community in North America, and is rapidly becoming so in Europe. However, it is radically different from other asset classes studied at Masters level (for example, bonds and quoted equity markets) and requires very different skills and disciplines, a knowledge of which will be essential to tomorrow’s investors. To impart a thorough understanding of how private equity functions as an asset class, what are the different sub-classes which it contains, how its returns are earned, and how these may be measured and analysed. The purpose of this elective is to explore, demonstrate and explain the storytelling techniques used by successful companies and executives such as the late Steve Jobs to influence internal and external audiences. Contemporary managers need these skills for diverse business situations, including addressing company meetings, advertising their business, corporate presentations, brand management, strategic planning and sales presentations. Attendees will be shown that successful corporations such as 3M, Xerox, IBM, NASA, Intel and Apple actively use storytelling techniques to explore and communicate complex management issues. Microsoft has its own story-telling department and a dedicated Director of Storytelling. 3M replaced its traditional business-planning process with one focused on story telling, and Oracle has adopted a programme to enhance its sales process through creating engaging product stories known as “story-selling”. With a focus on using storytelling as a business tool, this elective will give an overview of different theories of storytelling in a business environment. Students will be introduced to practical frameworks and toolkits that can be applied in organisations to enhance communication across business disciplines. By the end of the elective students will be able to apply their theoretical knowledge to a corporate and entrepreneurial environment using storytelling as an effective business tool. Recognise the factors that determine successful implementation of CRM programmes.